With 2011’s Wasting Light – which united Dave Grohl and notoriously heavy hit-making producer Butch Vig for the first time since the recording of Nirvana’s Nevermind 20 years prior – the Foo Fighters began to audibly resemble a much bigger band. 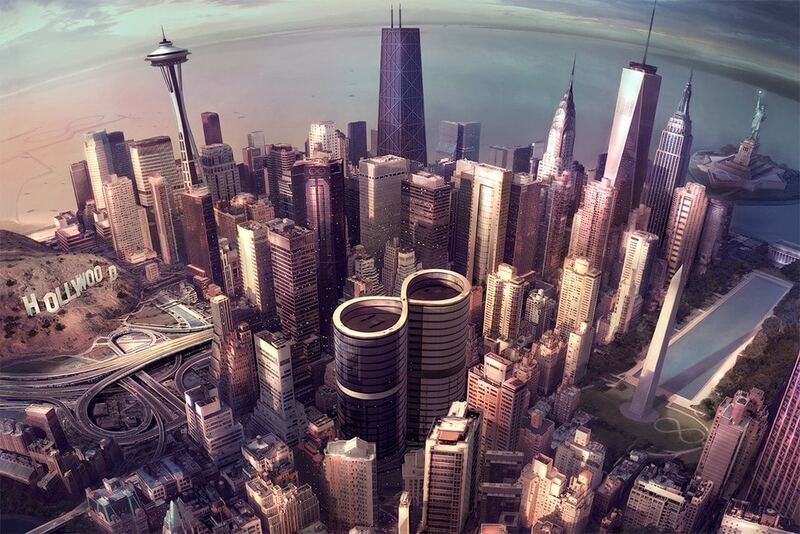 Now, with eighth studio album Sonic Highways, they bring to mind the trappings of a sprawling musical army, capable of recruiting nearly any player – regardless of stature – to their ranks. Vig held the reins again, but Grohl – drawing inspiration from his directorial debut Sound City, the documentary chronicling the history and influence of the legendary L.A.-area studio – controlled the concept: an 8-track album recorded across an equal number of sonically significant locales – Chicago, IL, Arlington, VA, Nashville, TN, Austin, TX, Joshua Tree, CA, New Orleans, LA, Seattle, WA and Los Angeles, CA – each featuring added musicianship from at least one hometown hero. Yet while the Sound City-inspired offshoot group – the Sound City Players – saw Foos playing backup band for rock greats like Stevie Nicks and Rick Springfield, Sonic Highways (which coincides with a Grohl-directed HBO documentary series launching Oct. 17) presents the Foos as a band in the running for – and seemingly capable of claiming – the title of America’s most important rock band. In the same way that new music has attained relevancy for ages, much of this is achieved by referencing the past. The aptly titled opening track “Something From Nothing” takes the familiar raucousness of smash hits “The Pretender” and “All My Life,” but manifests more monstrously with added baritone guitar from Cheap Trick’s Rick Nielsen; deliciously rockin’ collaborations with Grammy winners Zac Brown and Gary Clark Jr. on “Congregation” and “What Did I Do?/God As My Witness” (respectively) embrace a contemporary classic rock sound sure to nab more gramophone nods; and though “Subterranean” kicks it down a notch with an introspective aided by Death Cab For Cutie frontman Ben Gibbard, there are always cuts like the ferocious “Feast and the Famine,” which taps guest gang vocals from former Scream band mates Peter Stahl and Skeeter Thompson, to forcibly remind that Grohl was once a key player among the titans of grunge and garage-punk. “We need a monument / and dreams will come / and dreams will come/ is there anybody there? / anybody there?” Grohl proclaims/asks (really, banshee-screams) before the latter song’s wonderfully catchy chorus. The monument in question might as well be this remarkable exploration of and ode to American music. And as for whether there will be people there to witness it and sing its praises … well, it seems unlikely that the band poised to become one of the most significant in music history will have any problems in that department. It really ain’t too early to call it: Foo Fighters forever. Editor’s Note: An abbreviated version of this review appears in the November/December 2014 print edition.